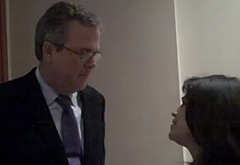 Adryana Boyne: Hello, we are here with Texas GOP Vote and VOCES Action, and I’m here with Governor Jeb Bush. It’s Nice to meet you Governor. Gov. Jeb Bush: Nice to meet you too. Welcome to Miami. Adryana Boyne: Thank you very much. I would like if you could give us a message for Texas and for all the American people about why the Latino vote is important for this upcoming election. Gov. Jeb Bush: Well, the Latino vote for the next five elections will be important because it’s the fastest growing population in our country and Latinos preside in the swing states. So, if a president wants to be elected, they have to court Hispanic voters because they are the fastest growing swing voters in the swing states. So, whether it’s New Mexico, Colorado, even Texas, certainly Florida, North Carolina, Virginia, the fastest growing demographic are Hispanic voters, and that’s why it is important. But it’s also important because we miss an opportunity as conservatives to advocate an aspirational message to aspirational people. Adryana Boyne: One of the things that I notice that sometimes people don’t understand the importance of finding a realistic immigration solution. I like what you have shared, so just briefly, what do you think Republicans have to do to so we can get a Latino vote regarding this issue? Gov. Jeb Bush: Well first of all, to speak about immigration in the broader context. We are a nation of immigrants. We benefit from immigration. It’s our secret weapon for economic competitiveness. It brings vitality to our country. A message that is exclusively focused on border enforcement is a sterile message. Hispanic voters support border enforcement. They want the borders controlled, but they also want to create opportunities for people that work hard and play by the rules to create prosperity for themselves and their families and their communities. So I would talk about immigration in economic turns, how powerful it is for our country. We are a country of immigrants, but we now think that immigration, somehow, isn’t part of the American story, which it is. We are a country that grows older each day. Not you but me. We get older, and as we get older we need younger people, young energetic aspirational people that make it possible for us to defy the demographic challenges, the time bomb that exists globally. China has huge problems. Japan has problems. Europe has problems. Only The United States could absorb immigrants in a way that allows for economic growth and prosperity for people. So, a broader deeper message is what’s necessary.